Primobolan Tablets are an impactful oral steroid used for attaining lean muscles by the fitness conscious individuals. It is manufactured by the pharmaceutical company Bioniche Pharmaceuticals and contains the substance Methenolone Acetate. Irrespective of the ester present in it, Methenolone Acetate is a mild anabolic steroid with comparatively a lower level of androgenic features. This oral steroid is preferred by the athletes for its amazing beneficial properties. Besides, in terms of side-effects, it has a lesser impact on the user’s health as compared to other oral anabolic steroids. This is preferred by the professional athletes for reducing their excessive fat from the body. With the combination of regular exercising and balanced diet, it helps the individuals in gaining lean muscle mass. 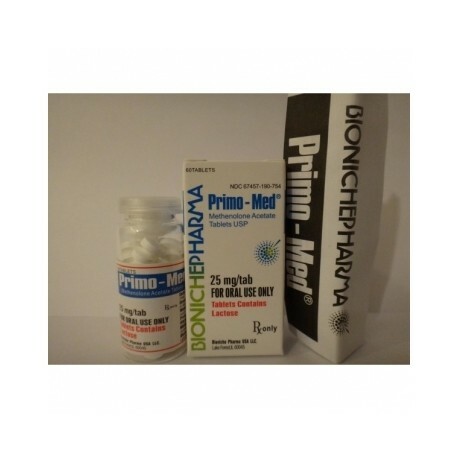 Primobolan Tablets manufactured by Bioniche Pharmaceuticals are used by the professional athletes during the cutting phase of their training period. Though the users can’t expect great muscle mass, but it is impactful in shedding down extra pounds. This boosts the level of confidence and enhances performance in their respective fields. The proportion of dosage of the products depends on several factors related to the individual. But, on a general basis the regular users, administer a dose of 200-300 mg per day. As for the beginner users, the dose is high, hence, they must begin with 10 mg per day. For more details about the administration procedure, contact a trusted and professional health expert.